State Sen. Steve Halloran answers a question at Sunday’s meeting promoting a Convention of States effort. He urged attendees to contact State Sen. Dan Hughes in support of the measure. Some 13 states have already called for a Convention of the States to draft proposed constitutional amendments to establish congressional term limits, fiscal restraints and limits on federal power. Should two-thirds of the states, a total of 34, follow suit, such a convention must be called, and any constitutional amendments resulting would be sent back to the states. If three-fourths of the states then ratify those amendments, they would become part of the Constitution. Leaders of the Convention of States grassroots movement include Mark Meckler, co-founder of the Tea Party Patriots, and Michael Farris, founder of the Home School Legal Defense Association. Speaking in McMillen Hall on the McCook Community College campus, Sears presented a PowerPoint including a video lauding Col. George Mason as the author of the second part of Article V of the Constitution, which allows for a Convention of the States, a method which has never been used. Previous constitutional amendments have originated in the Congress, not in the states, but both require ratification by three-fourths of the states. Featured speaker State Sen. Steve Halloran noted that the national debt had exceeded $20 trillion for the first time, and “onerous” federal regulations that “stifle the economy,” if printed on standard typewriter paper, would stack higher than the Washington Monument. He imagined the first thoughts of a new member of Congress, settling into their new office. The answer, usually, is bringing more federal money to the home district. The power of “career politicians” is such that 85 percent of incumbents are re-elected every time they stand for election, he said. Questioned about the loss of “institutional memory” and increased power for lobbyists and bureaucrats when term limits are imposed, Halloran said, if someone doesn't learn the legislative ropes in the first 30 days, serving seven or eight more years probably won't make a difference. 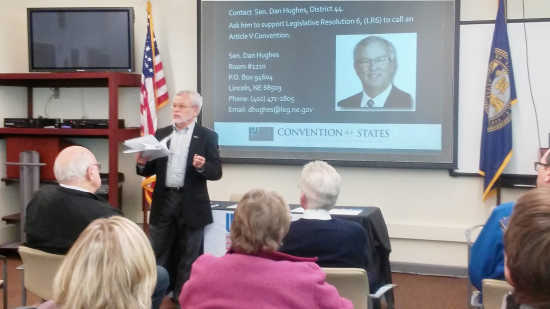 Halloran, from Legislative District 33, called on the audience to contact State Sen. Dan Hughes, representing local District 44, to support the Convention of the States. “Sen. Hughes is a reasonable man, I think he can be convinced to let us at least have a vote,” Halloran said. He said he attended a “planning convention” in Arizona to consider rules that would govern a Convention of the States, and while the resulting guidelines are not likely to be adopted in whole, they should help “kick start” the process. At least two members of the audience expressed concern that such a convention could “go rogue,” and worried about who would select each state's delegates. While each state gets only one vote, there is no limitation on the number that could attend. Halloran and other organizers attempted to assure them the convention would be required to stick to the prescribed subjects, and delegates from any state could walk out at any time, threatening to render the proceedings meaningless because of the lack of a quorum. Nebraska is already on record, since 1979, in support of a balanced budget Convention of the States, and a balanced budget amendment would be the most difficult to achieve. However, lawmakers are equally unlikely to limit their own powers or terms. “To me, nothing should be for a lifetime except marriage,” Halloran said when questioned about limiting terms for judges as well. Former McCook School Board member Jim Coady agreed with a call for voters to be more involved and knowledgeable, noting that whenever they ask the state to lower property taxes, it results in more power being taken away from the local school board. Former State Board of Education member Kathy Wilmot expressed concern about the proposed convention, later giving the Gazette literature contending the effort was funded by left-wing activists attempting to gut Second Amendment guarantees of individuals' right to bear arms. Halloran said the movement has 3.3 million supporters, including representatives in every congressional district. Politicians telling us to not trust politicians. Very practical reminder this holiday season. A convention to propose amendments to the US Constitution relates the second part of Article V. Whatever the source of an amendment, 3/4 (currently 38) of the several states must ratify it for it to amend the Constitution. The scope of a Convention is strictly limited to what is laid out in each State's application to Congress. When 2/3 (34) of the States apply to Congress with applications embracing common language, Congress must call a convention. After that, Congress can not be involved, but 38 States are still required for ratification. Here are some facts: Congress as currently constructed, has no interest in a balanced budget, term limits, judicial restraint, and much more. Sadly, given the apathy and ignorance of a growing plurality of the populace, our last resort appears to be our only recourse. The Framers predicted this might happen and wisely ensured it is part of our Constitution. I have read that financial backers of this movement were the original supporters of the tea party. People could have already been on board if interested; the motion died for lack of a second. Corporations are enjoying record profits. I would suppose there are those that still believe a tax reduction for those corporations will result in more hiring, just like these people think the constituency is so absent minded they will fall for the tea party malarkey if it is cloaked in a different wrap.